With over three thousand copies of their debut album The Awkward Phase sold, Kansas City’s own Antennas Up’s music is this year’s hottest indie-rock creation. Although they have been compared to the likes of contemporary favorites such as Phoenix and OK Go, Antennas Up mixes classic hints that are reminiscent of artists like Elvis Costello. This pop/electro/rock fusion has seen many forthcomings since the release of their first album in 2009; the band took to a cabin in the woods of Maine for one month of isolation and songwriting to hone in ideas for their new album The Awkward Phase. Their focus seems to have paid off. —The Awkward Phase spent over ten weeks on CMJ’s “Top 200 List.” Their music has also been featured on the television series Gossip Girl, MTV’s Underemployed and more. 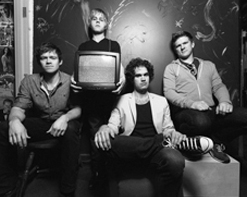 During 2012, Antennas Up performed at over thirty universities and toured alongside bands such as Girl Talk, Flogging Molly, and Matt & Kim. The music video for “Awkward Phase” is a high-intensity twist on a classic format. Filmed by Gene Smirnov (The Smiths, The Shins) and edited by Brook Linder (Someone Still Loves You Boris Yeltsin, Ha Ha Tonka), this video turns a standard performance video into an all-out optical assaut with its epileptic editing and spastic cinematography. Click here for Antenna’s Up’s artist page on HIPVideoPromo.com.